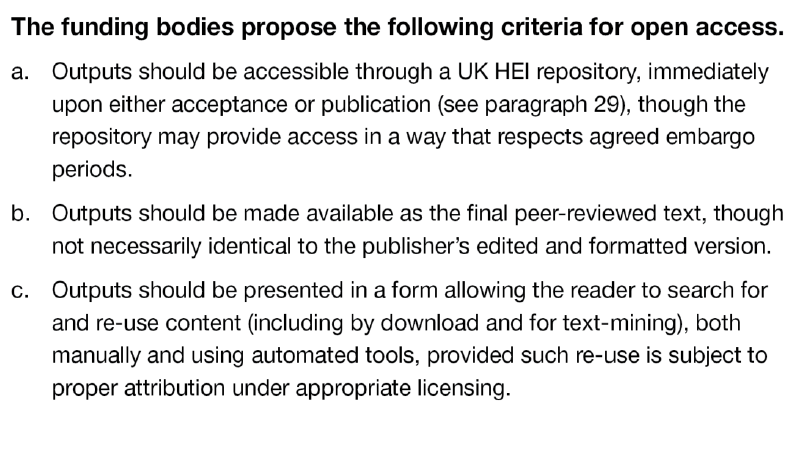 Just when we thought that the powers that be might be starting to see the light on Open Access, round comes another circular from the Higher Education Funding Council for England (HEFCE) that shows that policymakers have an unlimited ability to get things wrong at the most basic level. The document concerned opens a “Consultation on open access in the post-2014 Research Excellence Framework” by putting forward a number of proposals. Now it’s depressing enough that the entire document is predicated on the assumption that there will be another Research Excellence Framework, perhaps in 2020. The current REF is such a disaster that one might have hoped somebody up there would have decided that enough is enough. But then we thought that about Research Assessment Exercise in 2008. Even the most pessimistic of us hope that the REF would have a “lighter touch” than the RAE, but as it has turned out it’s many times worse both in the time it has taken to prepare submissions and the ridiculous game-playing and dodgy employment practices that it has encouraged among participation institutions. I hope there’s still time to drive a stake through the heart of the runaway bureaucracy that keeps imposing this idiocies on us. After all, a new Chief Executive about to take over at HEFCE. Perhaps a new broom will be wielded? I hope against hope. Why on Earth should the proposals favour national institutional repositories over international subject-based ones? A shining example of the latter is the arXiv which has, for Physics and Astronomy, become the basic resource for researchers around the world; it’s a one-stop shop at which one can access research from all around the world. 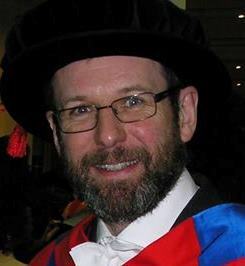 By contrast, having work in the same field stored over a plethora of institutional repositories will serve no useful purpose at all, because UK research will not treated in the same way as work from other countries and in any case individual repositoes will lead to an absurd level of duplication of infrastructure and other resources. This requirement is particularly indefensible in Physics and Astronomy, as it would require us to duplicate in (probably inferior) institutional repositories what we already do with the arXiv. The UK Funding Councils need realize that the solution to many of the challenges of Open Access has already been found. In fact, the European Research Council seems to have acknowledged this and is now directly funding the arXiv. The UK Research Councils should be required to construct similar archives for their disciplines. That shouldn’t be difficult, because all the hard work has already been done. There is a working model. I’ll be responding to the consultation document in no uncertain terms. The Royal Astronomical Society is also collating responses for a collective submission. We have to resist these, and other proposals such as another REF, which are being foisted on us by people who have no idea what they’re doing and no idea what damage they’re causing. There’s a disturbing story in the latest Times Higher which argues that the University of Leicester has apparently reneged on a promise that non-submission to the forthcoming (2014) Research Excellence Framework (REF) would not have negative career consequences. They have now said that except in exceptional circumstances, non-submitted academics will either be moved to a teaching-only contract (where there is a vacancy and they can demonstrate teaching excellence), or have their performance “managed”, with the threat of sacking if they don’t meet the specified targets. I’d heard rumours of this on the grapevine (i.e. Twitter) before the Times Higher story was published. It’s very worrying to have it confirmed, as it raises all kinds of questions about what might happen in departments that turn out to have disappointing REF results . There are (at least) two possible reasons for non-inclusion of the outputs of a researcher and it is important to distinguish between them. One is that the researcher hasn’t enough high-quality outputs to submit. In the absence of individual extenuating circumstances, researchers are expected to submit four “outputs” (in my discipline that means “research papers”) for assessment. That’s a pretty minimal level of productivity, actually; such a number per year is a reasonable average for an active researcher in my field. A person employed on a contract that specifies their duties as Teaching and Research may therefore be under-performing if they can’t produce four papers over the period 2008-2013. I think some form of performance management may be justifiable in this case, but the primary aim should be to help the individual rather than show them the door. We all have fallow periods in research, and it’s not appropriate to rush to sack anyone who experiences a lean time. Andrew Wiles would have been considered `inactive’ had there been a REF in 1992 as he hadn’t published anything for years. Then he produced a proof of Fermat’s Last Theorem. Some things just take time. The memo suggests that academics would be spared repercussions if, among other reasons, the number of individuals submitted is “constrained” by the volume of case studies their department intends to enter to demonstrate research impact. Institutions must submit one case study for every 10 scholars entered. Maria Nedeva, professor of science and innovation dynamics and policy at Manchester Business School, said the tactic of deciding how many academics to submit based on impact case study numbers was “rife”. e case study for every scholars included plus one, i.e. forThe statement at the end of the quote there is in line with my experience too. The point is that the REF is not just a means of allocating relatively small amounts of so-called `QR’ research funding . Indeed, it remains entirely possible that no funding at all will be allocated following the 2014 exercise. The thinking then is that the number of staff submitted is largely irrelevant; all that will count is league table position. This by no means the only example of the dangers that lurk when you take league tables too seriously. If a department is required to submit, say, four impact cases if all staff are included in the REF submission, but only has three viable ones, it would not be unreasonable to submit fewer staff because their overall would be dragged down by a poor impact case even if the output quality of all staff is high. There will certainly be highly active researchers in UK institutions, including many who hold sizable external research grants, whose outputs are not submitted to the REF. As the article points out, it would be very wrong for managers to penalize scholars who have been excluded because of this sort of game-playing. That’s certainly not going to happen in the School of Mathematical and Physical Sciences at Sussex University. Not while I’m Head of School, anyway. Moreover, even researchers whose “outputs” are not selected may still contribute to the “Environment” and/or “Impact” sections so they still, in a very real sense, do participate in their department’s REF submission. My opinion? All this silliness could easily have been avoided by requiring all staff in all units of assessment to be submitted by all departments. You know, like would have happened if the system were actually designed to identify and reward research excellence. Instead, it’s yet another example of a bureaucratic machine that’s become entirely self-serving. It exists simply because it exists. Research would be much better off without it. University Research Funding: Will the Axe Fall on QR? As we tremble in anticipation of this week’s Spending Review, which will determine the budgets for Science and Higher Education in 2015/16, there’s fairly strong evidence that Chancellor of the Exchequer George Osborne is looking to save about £11.5 billion of public spending. Given that funding for some Whitehall departments is ring-fenced there is considerable speculation that the axe will fall heavily on the Department for Business, Innovation and Skills (BIS), which seems likely to have to make over £1 billion of savings. But where will these savings in the BIS budget be made? The government has made noises that it will protect science funding (at least in cash terms) so big cuts in the larger research council budgets appear unlikely. However, Treasury officials have been rumoured as thinking that the Universities are now “awash with money” and should therefore be cut. On the other hand, incoming for University teaching now largely comes from fees so there’s very little of the HEFCE teaching budget to cut further. are preparing submissions to a new system called the Research Excellence Framework (REF), which was always intended to be used to distribute QR funding from 2015/16 onwards. But what if the government decides that the only way to balance the books is to remove the QR funding stream entirely? £1,558 million for research. The ring-fenced settlement for science and research means that we will be able to maintain overall funding, in cash terms, until 2014-15. But this does not include the period covered by the spending review, so it’s perfectly possible that the “ring fence” could be removed, or at least re-interpreted as a result of this spending review. The government could argue that QR and Research Council grant income correlate so well that there’s no need to continue with the current dual funding system, by which the Research Councils provide grants for specific projects and programmes and the higher education funding bodies provide block grant funding to universities via the QR line. It could also argue that the high fees being charged mean that Universities will be able to cope with these cuts without undue hardship. There is a precedent in Wales, where HEFCW will not be awarding any QR funding after the 2013 REF, so why shouldn’t England do the same? They could also get away with the argument that this money isn’t part of the ring fence mentioned above. The only problem is that so many institutions have spent so much time on preparations for the REF that cancelling the funding associated with it will mean all that effort is wasted. Indeed, the only remaining justification (if it can be called that) for Universities participating in the REF is for position in various league tables, which is rather a lot of expense for something of extremely debatable value.